Sliabh Liag is Ireland’s ultimate sea cliff experience and a signature point on the Wild Atlantic Way coastal touring route. Sliabh Liag is a place of sacred Christian pilgrimage and a rich Irish heritage and culture. Located in the Gaeltacht region of County Donegal Sliabh Liag are the highest accessible sea cliffs in Europe where the cliff face of Bunglas rises over 600m above the ocean below. Prepare to be dazzled by the panoramic view across Donegal Bay, which is simply breathtaking. Experience the unique wonders of the natural biodiversity of marine flora and fauna found here. A natural masterpiece of colour across a land and seascape where azure skies, wispy white clouds and cool blue seas meet the sun beaming light onto the myriad of hues of ancient rock formations shades of green and purple heather. Sliabh Liag is truly Mother Nature’s finest canvas where tales of myth and legend, local history and Irish tradition seem to be painted into this wild and rugged landscape. 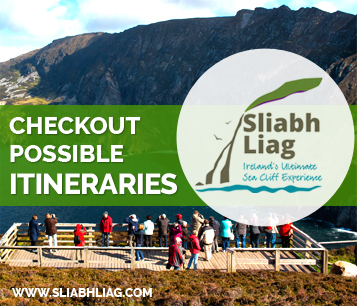 To fully enjoy the spectacle of Sliabh Liag we recommend that you walk the few miles to the cliff viewing point, so as not to miss the exciting scenery of the area. Walk up the winding road to the main Sliabh Liag viewing point past the lake and local sheep, where at the top; you will be rewarded with the most stunning views as Donegal Bay sweeps in towards you. 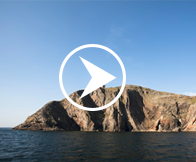 See the Sliabh Liag cliffs from the sea for a truly awe inspiring view. Various boat tours depart from Teelin Pier and the friendly skippers will delight you with a tale or two. Stop off in a sheltered cove and relax in the sun. Why not try a spot of angling or a swim in the sea on your boat trip? With basking sharks and dolphins known to visit these waters on a regular basis, in particular during summer, you might not be swimming alone! Sliabh Liag is a walker’s paradise and offers various trails for different skill and fitness levels. The famous One Man’s Path loops around onto the Pilgrim’s Path and is not for the faint hearted.